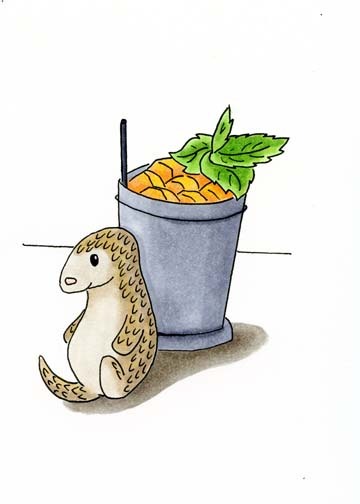 A Pangolin and Mint Julep. There is nothing like something mint flavored and icy on a warm day. Done with copic markers and liners. Names are a tricky thing. If you just name things with what’s in it you’ll start running into duplication issues. Maybe not so much with pangolin’s but how many husky’s with tennis ball do you think an artist working with furries might draw? I do declare, it’s a mint pangolin might be a tad bit long but it’s got some fun behind it. Available in bookmark and 5×7 print.